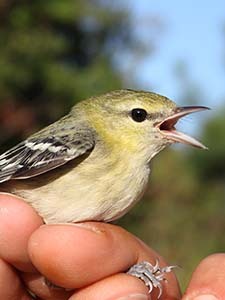 High quality stopover sites along the migratory path are critical to migrant songbird populations because arrival timing on the breeding grounds impacts breeding success. Both sexes gain a reproductive advantage by arriving on the breeding territory with extra fat reserves (Sandberg and Moore 1996) obtained during stopovers. During the spring, Blackpoll Warblers, Dendroica striata, stopover in large numbers on Virginia’s coastal plain (Burleigh 1934). In this study, I set out to examine the energetic value of the region to migrant Blackpoll Warblers by examining the geographic patterns of migration, generalizing foraging ecology of Blackpoll Warblers, and determining whether this region represents a source of energy for migrants. It appears Blackpoll Warblers are responding to available energy resources, and that this region represents a source of energy for Blackpoll Warblers during the spring migration.